Positives: After a very long road, made his major league debut on August 12….got two hits in his debut, including his first hit that didn’t really leave the infield….hit his first home run a week later, a pinch-hit blast against the Brewers that accounted for all the scoring….had three multi-hit games….hit .333 against lefties but three of his home runs came against right-handers….batted .300 with two home runs coming off the bench….hit .292 and had a 1.060 OPS at home….had a 1.145 OPS in August….had a .962 OPS in games the Cardinals lost….hit .500 (2-4, 2 HBP) on the first pitch….had a 1.222 OPS with nobody out….had a 1.266 OPS when the count was even….hit .333 in high leverage situations….hit .429 in the first three innings of a game….hit .500 with a 1.458 OPS against power pitchers….hit .300 against fly ball pitchers….went 4-for-9 with a double and a homer against the Cubs and Brewers combined….hit .288 with 15 homers at Memphis. Negatives: Hit .229 for the month of September, though two of the hits were homers….hit .207 against righties….hit .231 on the road with just one home run….had a .217/.308/.478 line in Cardinal wins….hit .233 as a starter….hit .154 when he played third base, where he got most of his at bats….had a .578 OPS when he was ahead in the count and .636 OPS when he was behind….with two outs, he hit .154….had a .733 OPS with runners in scoring position….went 0-6 with two outs and RISP….had a .732 OPS against starting pitching….hit .138 in night games. 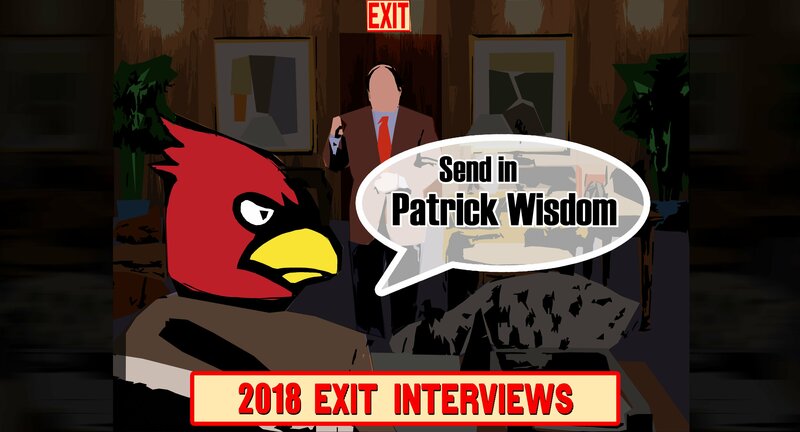 Overview: I never, ever expected to be writing an Exit Interview about Patrick Wisdom. Left unprotected at least once for the Rule 5 draft, a man not on the 40-man roster until the day he was called up, Wisdom was the textbook definition of an organizational soldier. The club seemed to appreciate what he could do in Memphis but not enough to do the roster gymnastics it took to bring him to the big leagues. Finally, they had no choice as injuries depleted their depth and forced them to turn to a man in his third tour of duty at Memphis. It was a feel good story when he came up and immediately produced and I think everyone was glad to see that he made the most of his time in St. Louis, plus he may have forced the front office to do some re-evaluation of where he stood in their plans. Outlook: While they may value Wisdom higher than they did before, that still doesn’t mean he’s a top priority. There’s nothing that indicates Wisdom’s success wasn’t a function of the league not knowing much about him, though that’s not his fault. It’s a small sample and you can’t really be sure what he might be. However, Wisdom is already 27, so what you see is probably what you get. Is it enough to be a bench bat for the Cardinals next year? It might depend on the moves that are made this winter. With Josh Donaldson not coming to St. Louis, the infield solutions are a little hazier. If someone new comes in to play one of the corners, Wisdom might be the casualty unless Jedd Gyorko is part of the deal. Greg Garcia being gone might help, but really Wisdom is sitting on the margins and if someone comes in, he’s likely to get pushed off.